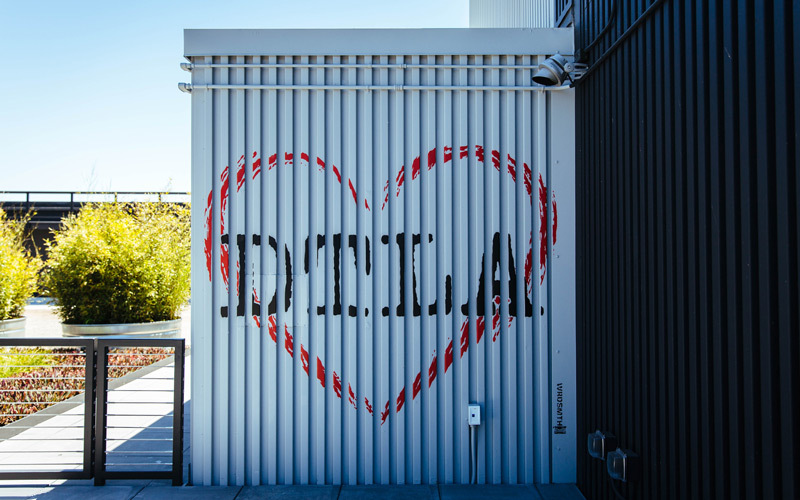 Known for his Zig Ziglar-style inspirational street art, WRDSMTH’s latest installations in The Bloc (the mixed-use DTLA development at 700 S. Flower) will be revealed officially on Thursday (and we have sneak peek photos of the three new rooftop pieces below). With eight pieces total, this marks the largest permanent collection for the L.A. street artist. 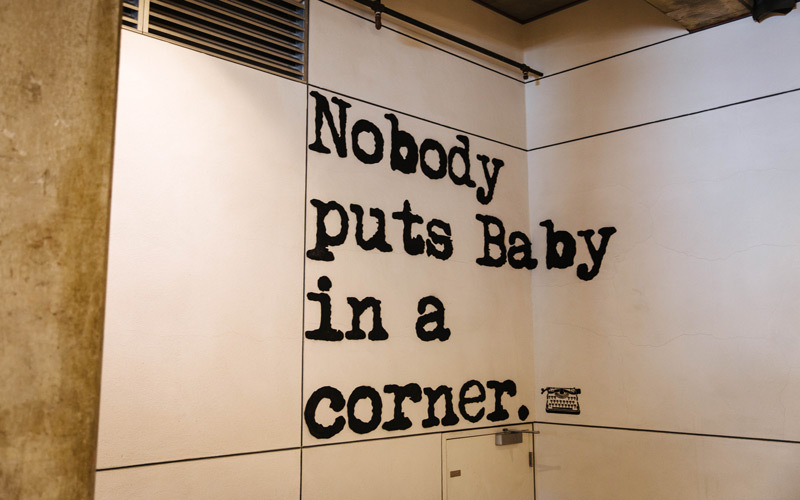 Four of the pieces are inside on the ground floor of the building’s southeast and southwest corners—including a collaboration with Antigirl (the heart by the “Dear LA” piece). You may have seen the fifth one by now—if not in person on the corner of Hope and 8th, then on Instagram. 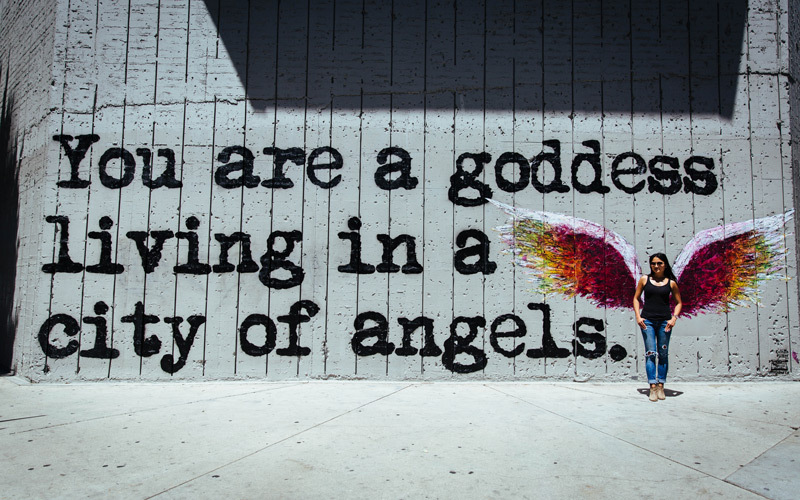 WRDSMTH’s “Goddess” takes up the entire corner of the building, complete with a punctuating set of Colette Miller wings. The final three are on the rooftop. Located on the 34th floor, the modern outdoor space is accessible to tenants only, and to private parties. (Keep scrolling for photos.) Meanwhile, we caught up with the artist known as WRDSMTH—he still prefers to officially keep his real name hush-hush—for some words. It’s a favorite word. Aspire to fill in the blank for whoever you are. 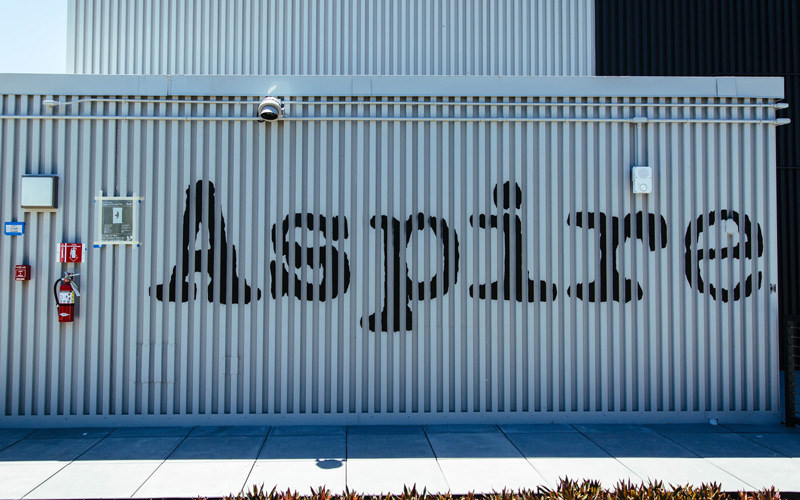 There’s something to this being a rooftop with the word “aspire” on the top floor. 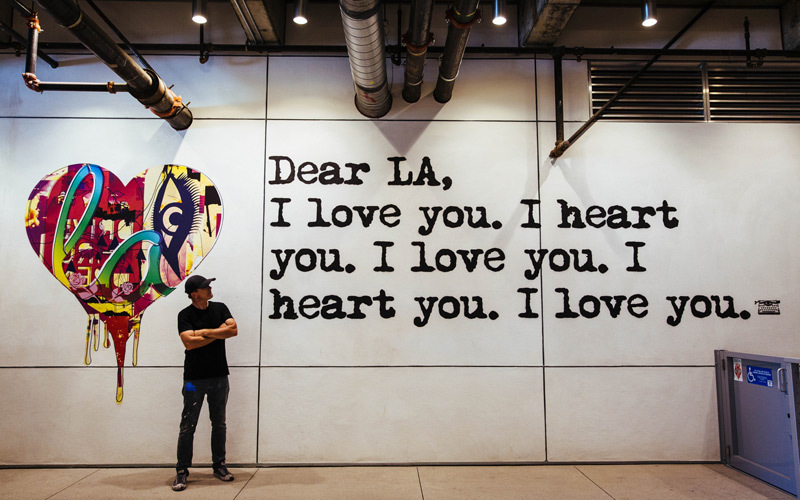 And L.A. as the creative capital of the world—people aspire to a lot of things here. Aspire to good. Aspire to your dreams. Aspire to greatness. 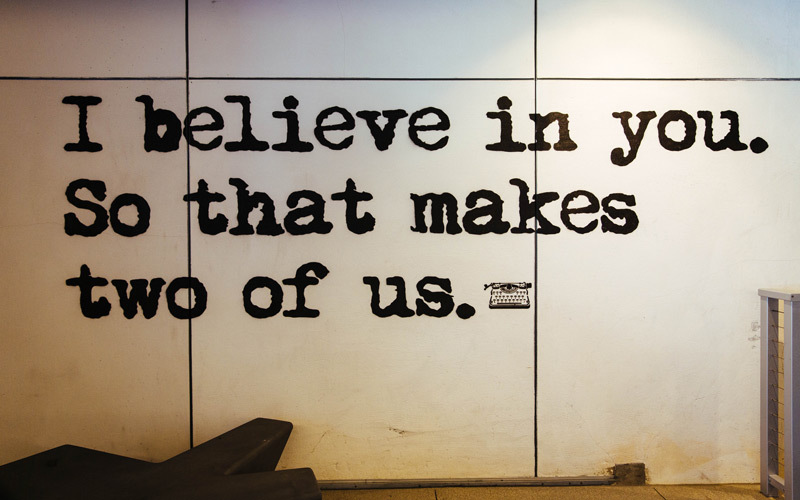 Aspire to whatever is positive for you. What were the challenges of these pieces in particular? I expected to be working on flat walls, but when I arrived two of the walls were corrugated. 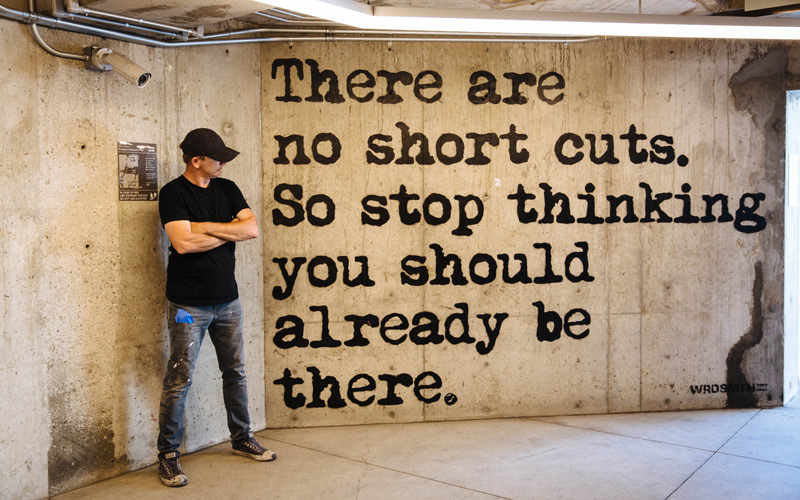 I’ve done one corrugated wall before, but not this deep: it skips two inches and goes two inches deep. If I painted within it, it would look distorted. So, I built my stencils to skip two inches. I didn’t know if it was going to work. I am always really critical of my work, and even I went “wow.” The experiment really turned out, especially within the environment. How do feel about your artwork being labeled “Instagrammable”? People actually interact with the walls, beyond just a backdrop for selfies. Part of the success of WRDSMTH is that we are living in a time period where we communicate with less words, by texting and emojis. So, the action of sending a photo of one of my walls to somebody is going the extra mile. It’s almost like sending a modern day Hallmark card. I’m part of that, and it’s just incredible. Like Colette’s piece on Melrose, these are destination art pieces that have the ability to make people smile or brighten their day and then they send it on, like a butterfly effect. Long passages aren’t usually your thing. Why do so with “Blue Elephants”? Well, it encourages reading. And that’s a good thing. Secondly, it’s a passage from a book I wrote about making it in Hollywood. I started putting it up around town and people really resonated with it. How does the passage correlate with The Bloc and DTLA? 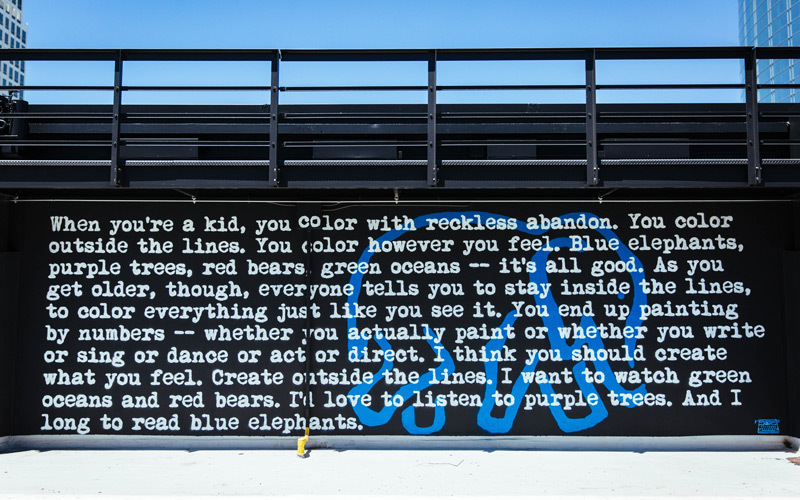 DTLA is at the heart of the city, and “Blue Elephants” celebrates the act of following your calling, trusting your talent, chasing your dream, and believing in yourself. You have to write/sing/dance what you want, instead of what’s popular, and people will respond. Most surprising aspect of the The Bloc installations? The “Goddess” piece. I’m amazed at how much it’s being embraced. It celebrates everything I wanted it to celebrate: the area, The Bloc, and the women’s movement. Are there any secret messages or hidden artwork in The Bloc? If you bring an artist to a location and let them do their thing, they might hide some pieces that the executives don’t know about. It’s big, that’s the one clue I’ll give you.